Eve usually reserves screams of this decibel level for emergencies and crises, but not always. I was in the kitchen, quickly throwing together lunches and breakfasts and looking for missing shoes. Eve was at the top of the stairs, utilizing the best acoustics in the house to spread her screams as far as possible. "Eve! I'm in the kitchen. Unless you have a broken leg, you better stop screaming like that!" She didn't. Stop screaming or have a broken leg. Not looking up from my cooking, I acknowledged her presence with a quick, "You're still screaming. What is wrong?" This was what was wrong. And I had no idea how to fix it. 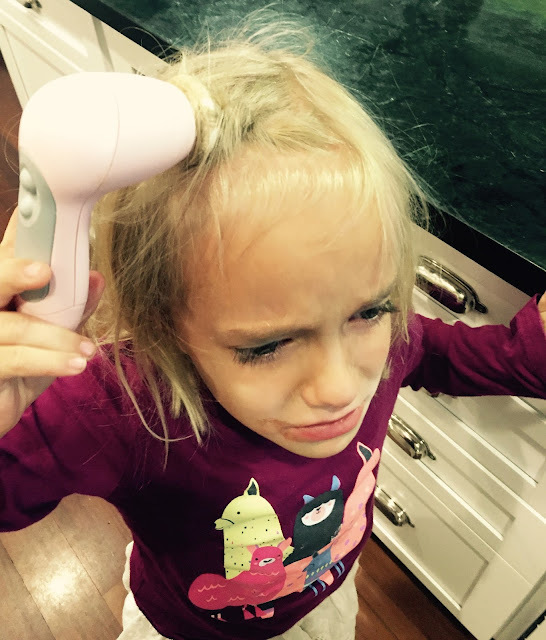 Having no idea that this was Lily's face scrubbing brush and not a baby hairbrush, Eve innocuously turned on the scrubber and ran it through her hair. 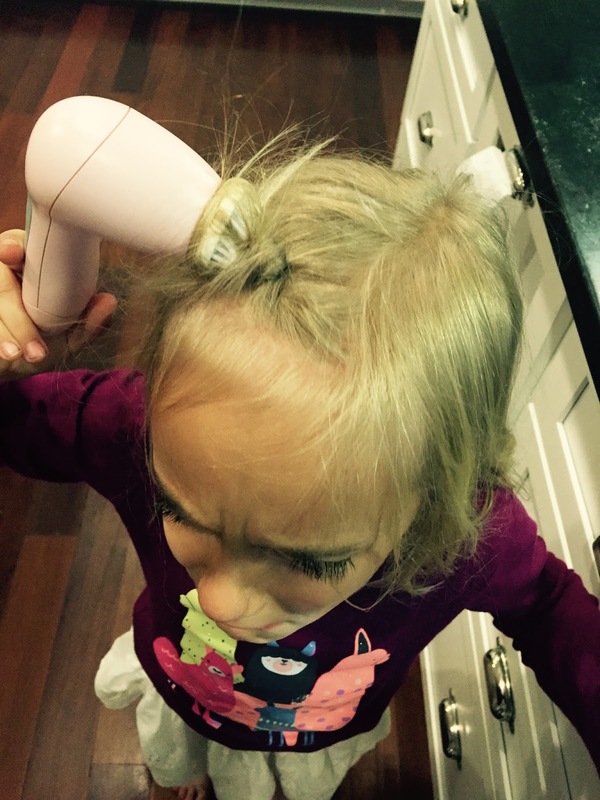 Well, tried to run it through her hair. Well, didn't run it through her hair. Well, tangled it up real good in her hair, to the point that it was pulling those blond strands out one by one while she screamed. How does one remove a face scrubbing brush from hair? I don't think a google search would yield any information, plus I didn't have time for that. MacGyver was also unavailable, so I did the best I could. I yanked and untwisted and unwound. 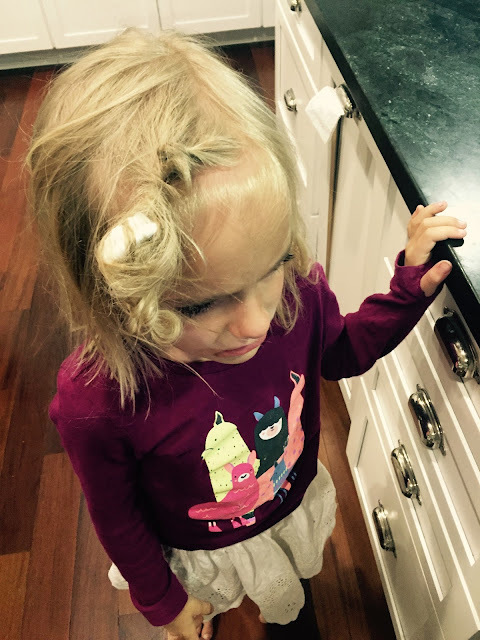 Under my breath I said, "Hope we don't have to shave her bald to remove this thing." She heard it. Bad mom move. Her screams escalated as she repeated the word bald over and over. Really bad mom move. I succeeded in separating the head of the brush from its base, and once that was done, the process was actually much easier. From this angle, it looks like a halfhearted attempt at a cute hair twist. But I ended up salvaging most of her hair and sending her upstairs to brush her hair and change her clothes. 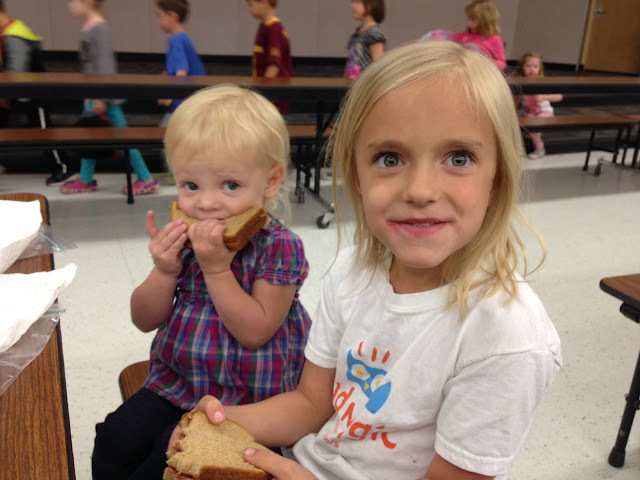 Much to her relief, she still had hair for school today, and she even got to eat lunch with her favorite tiny girl in the world. 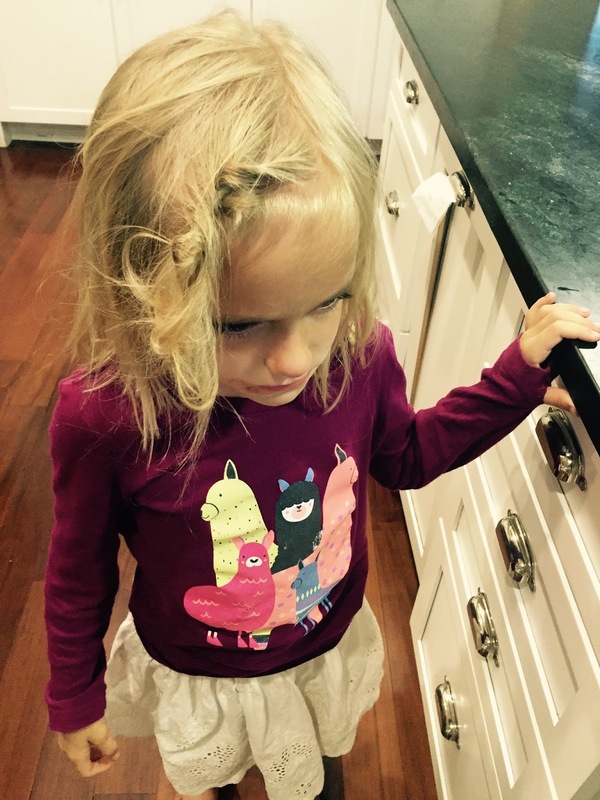 I don't know where her ponytail went between walking out the door to school and lunchtime . . .
She has a habit of getting into a hair situation. Remember the pixie cut did stick around long after the scissors incident. Not all tragedy is tragic. That is a real hair 'remember-when '. Poor Evie! Bwahahaha. I always wonder what goes through those little minds of theirs one second before they do...the thing.